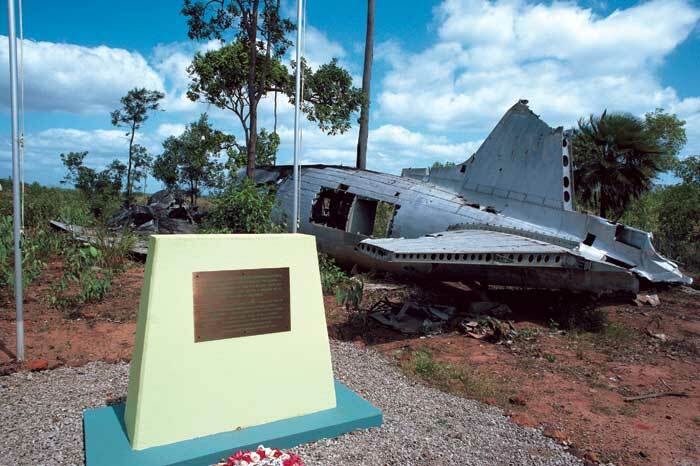 Thursday Island's war history is largely unkown amongst most Australians. Few Australians realise the vast extent of tangible WWII history still visible today. AT sets out to separate fact from fiction, while providing you with your own key to the living remnants of this global conflict on Australian soil. By Rod Eime Like so many late Baby Boomers, I grew up with the tales and furphies of my parents’ generation who were convinced a Japanese invasion of Australia was averted at the last minute. We were saved by the stoic nationalism of Prime Minister John Curtin and our heroic boys, who stopped the Japs in their tracks at Kokoda. Or so I was told. I’ve lost count of the many octogenarians I’ve upset by echoing the official Australian War Memorial line – that no formal plan to invade Australia ever existed and that even the Imperial Japanese Army described the notion as “gibberish”. Sure, some mid-ranking Japanese officers may well have floated the idea in the halcyon days of 1942, but it was quickly decried as logistically impossible. Japan could spare neither the men nor the ships for such a massive undertaking and instead satisfied themselves with the more workable scheme of isolating and neutralising us. And do you reckon he’s copped some flak? So great is the determination of the war generation to cling to these tales that the obviously very effective propaganda has morphed into folklore. Darwin would be bombed a total of 64 times, as well as Townsville, Katherine, Wyndham, Derby, Broome and Port Hedland before the end of 1943. Now, don’t mistake my apparently traitorous views as sedition. There’s no mistaking the fact that Australia was under direct attack. Folks had good reason to fear the “yellow peril” because in early ’42 they were on a roll and looking unstoppable. Beginning in February of that year, Darwin would be bombed a total of 64 times, as well as Townsville, Katherine, Wyndham, Derby, Broome and Port Hedland before the end of 1943. Massive aircraft-carrying submarines launched their midget subs into Sydney Harbour and proceeded to lob shells into the suburbs of Sydney and Newcastle, while their tiny spotter planes overflew Melbourne and Hobart. Despite the hysteria of the attack on Sydney Harbour on May 31, 1942, the single most devastating attack on Australian soil occurred on February 19, when more than 200 Japanese aircraft comprehensively bombed Darwin, sinking eight ships, destroying 23 aircraft and killing at least 250 people, including nine civilians in the post office. The two raids that day triggered waves of frenzied evacuations, looting and general mayhem as the remaining populace and many of the disorientated servicemen fled south in an event since dubbed “The Adelaide River Stakes”. Rumours of an imminent Japanese invasion circulated. Military orders were confused and haphazard. Days later, hundreds of servicemen remained unaccounted for. Luhrmann’s epic Australia concludes with this major set piece as its climax, when the heroes find themselves in the middle of the carnage. The movie will doubtless rekindle our fascination with wartime history and the some of the wild tales will resurface again. Just you wait. Did the Japanese land on Australia soil? Almost certainly. Several spy missions and reconnaissance parties were reported during the course of the war. One sighting turned out to be brolgas in the heat haze. Another in the Gulf of Carpentaria had an RAAF radar crew up all night trying to find a mystery surface blip near Mornington Island. Lieutenant Susuhiko Mizuno led a spy mission to the Kimberley in January 1944. He and nine others with Timorese decoys sailed a tiny fishing boat, the Hiyoshi Maru, and made several landings – one alarmingly close to the soon to be secret Truscott Air Base. True. There are numerous confirmed dumps and at least as many fantasy stashes of intact aircraft and material. The old flooded quarry at Brisbane’s Archerfield aerodrome was drained in the early ’90s by a crackpot in search of loot. He did turn up loads of stuff like aircraft scraps, guns and sundry items but the police shut him down suddenly when the whole thing got out of hand. Immediately after the war, hundreds of perfectly good aircraft and sundry material was dumped at sea. These events are well documented and during the ’90s (again!) 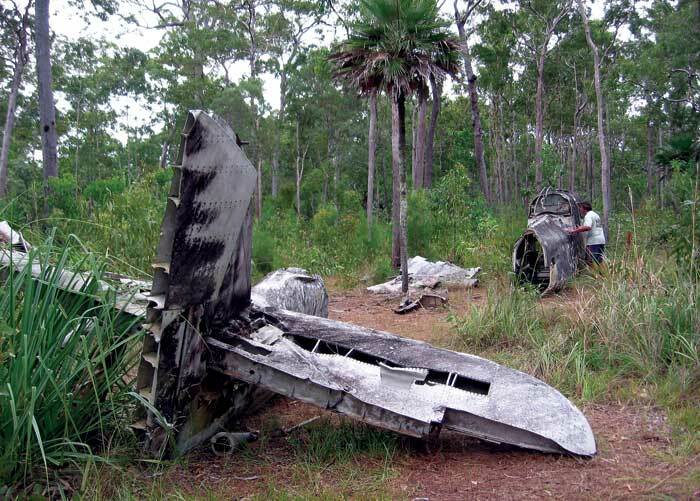 a company was formed to attempt the recovery of the many aircraft known to have been dumped off Noosa. They hauled in a few rusty parts and went broke. Where can I see stuff? 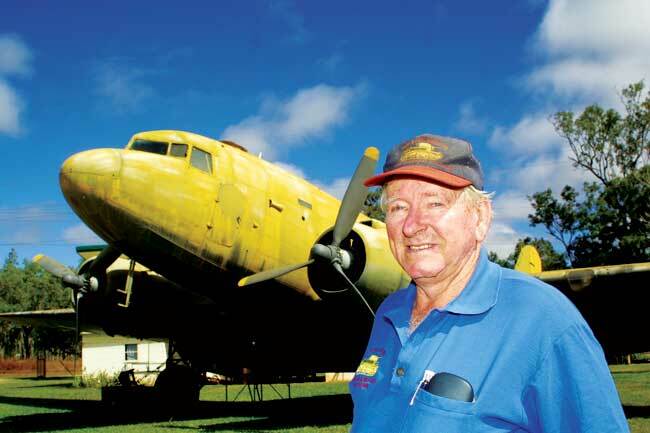 Syd Beck started collecting military junk from the old wartime base in Townsville as a childhood hobby. Now he has one of the largest private collections in the country, including a rare P-39 Airacobra fighter recovered after crashing on Cape York in May 1942. There are also tanks, vehicles, regalia, ammunition and weapons. Some of his cherished items, including a DC-3, were used as props during the filming of The Thin Red Line. 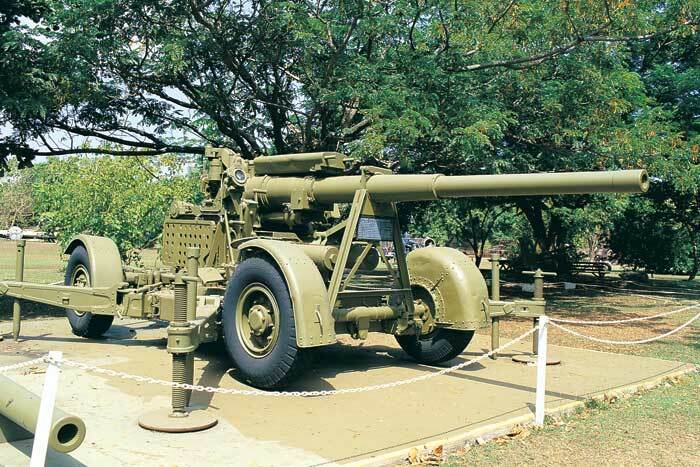 Located inside the refurbished Kissing Point Fort, this compact museum includes artefacts from other wars too. The fort was originally built in 1890 as part of the Army’s Jezzine Barracks. There’s also an RAAF museum in town. 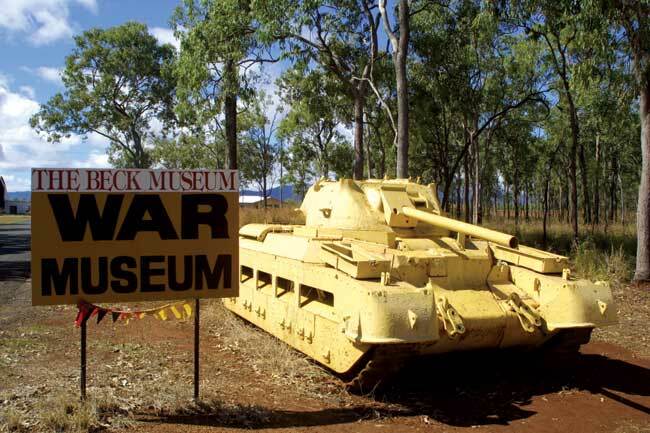 Driving up the Stuart Highway to Darwin you start to see many sign-posted historic WWII sites. Airfields, hospitals, supply bases and encampments dot the landscape all the way. Not much is left at many of these sites except for orphaned concrete foundations and some unclaimed scrap metal, but they stand testament to the urgency of the time. Larrimah was the end of the railway line to Darwin and war material was transferred from trucks of the 121 Australian General Transport Company (AIF) ferrying cargo from the other railhead at Alice Springs. Wander into the nearby bush and you’ll find lots of old vehicle wrecks and even some aircraft engines. With Darwin under constant threat of attack, airfields were moved south and what’s left can be seen today at locations like Coomalie Creek, Gorrie, Batchelor, Daly Waters, Pine Creek and others like Sattler, right next to the highway. 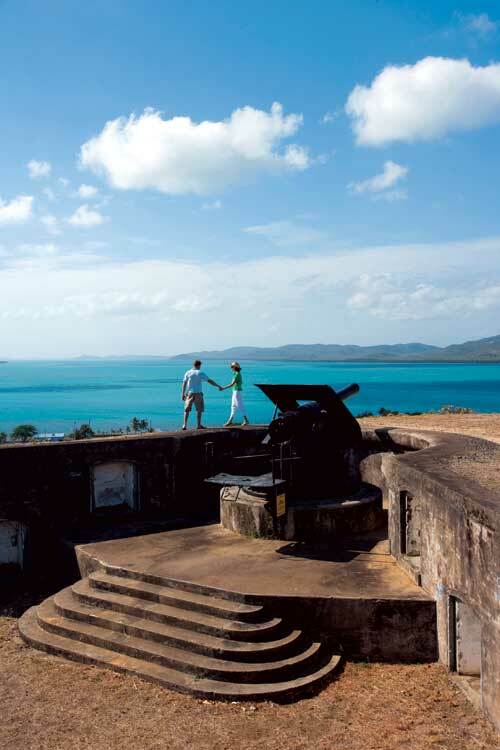 In Darwin you can visit the East Point Reserve (along Alec Fong Lim Drive towards Fannie Bay), where the huge gun emplacement still sits forlorn and exhausted after the frantic activity of the war. A comprehensive museum is housed in the old command post. In a wonderful twist, the 9-inch gun was sold for scrap in 1959 to the Japanese Fujita Salvage Company. A replica now sits in its place. The Australian Aviation Heritage Centre at Winnellie (08 8947 2145, www.darwinsairwar.com.au) was once a naval facility that miraculously survived both the war and the cyclone and now houses an impressive display of both modern and vintage aircraft, including a massive B-52 and what’s left of Sgt Hajime Toyoshima’s Zero that crashed on Melville Island. Captured and disarmed by Aboriginals, Toyoshima was the first Japanese POW and later died in the Cowra breakout. Directly beneath Darwin city are the fascinating Oil Storage Tunnels, built during WWII to preserve oil supplies against aerial attack, but never used due to inadequate sealing problems. The two tunnels open for guided tours are in Charles Darwin National Park and contain old WWII era photos. On Casuarina Beach just north of Nightcliff, on especially rare occasions when the tide is right out, you might be lucky enough to find the odd carving made in the sandstone cliffs by WWII soldiers. The Katherine Museum (08 8972 3945, www.katherinemuseum.com) has a top-notch WWII history display including their pride and joy, which predates the conflict: one of Clyde Fenton’s perfectly restored Gypsy Moths (Fenton as in “Fenton Airfield”, which was bombed repeatedly from June to September 1943). 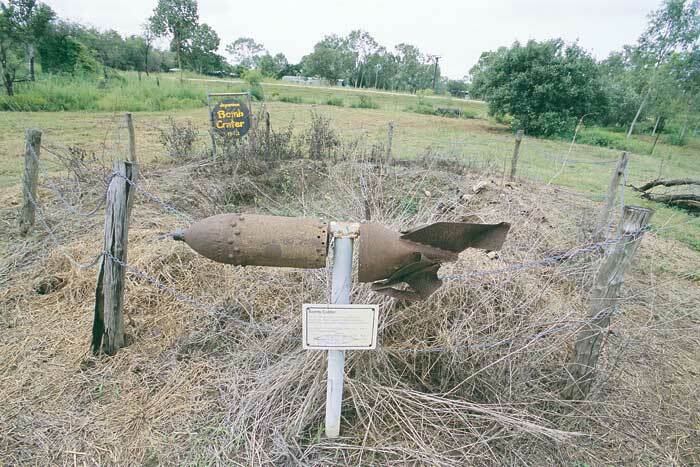 Nearby, still clearly visible from the road, is a bomb crater caused during a Japanese raid on Katherine in March 1942. It’s actually on private property – as is the old Gallon Licence Store, which still bears shrapnel scars from anti-personnel daisy cutters in its corrugated iron doors – but the owners don’t mind curious, respectful visitors having a look round. And it would be more than fitting to visit the Adelaide River War Cemetery, just over 100km south of Darwin, where 434 graves are situated – including those of the brave postal workers who died in that first horrific raid. Commuters on Sydney Harbour will be familiar with the numerous concrete lookouts and pill boxes dotted around the foreshore, but the North Fort on the southern tip of the Sydney Harbour National Park (near Manly) is one of the few authentic sites Sydneysiders can see on a day trip. Home of the National Artillery Museum, it contains a wealth of material way beyond its time as armed gatekeeper to Sydney Harbour. Wrecks of crashed Bristol Beaufort bombers and a DC-3 can be seen adjacent Bamaga (Higgins) Airstrip near the tip of Cape York. 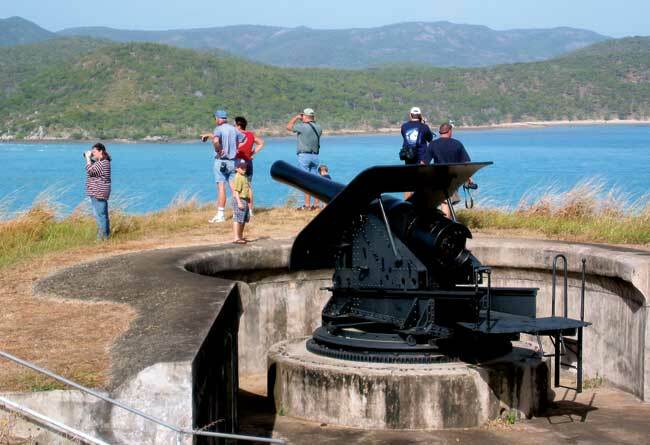 Milman Hill and Green Hill fortifications on Thursday Island and the old airstrip on neighbouring Horn Island contain a museum and relics of crashed B-17s. The new Truscott airstrip was once a secret staging base for attacks on Java. The remote Kimberley strip is littered with wrecks of B-24 Liberators, Spitfires and even a Japanese reconnaissance aircraft that came too close. Rottnest Island off Fremantle was built for WWI, but served again as a shore battery between 1940-‘45 when the Oliver Hill guns were installed. I agree with what you say about the Japanese wanting to invade Australia,Darwin was repeatedly attacked because the Yanks were refuelling ships there but I think attacks onm Sydney and Newcastle were nothing more than a morale destroying exercise.If you were an 18 year old in New Guinea and heard that your Mums Hills Hoist had been blown up in a Japanese shelling, chances are you wouldn’t want to fight anywhere except in your backyard. As the the “crackpot “at Acacia Ridge,I swam in that old quarry when i was a kid and we were constantly pulling up old bayonets that had been cut in two simply by diving for them.The police didn’t shut him down, he had all the right permits and he dragged more stuff out of there than was announced, there are photos on the net of machine guns,pistols,aircraft parts etc he got .I took a special interest in what he was up to as we had spent so much time there. Rod Eime has got things wrong like some of the old fellows. As regards the Archerfield quarry salvage project guns etc were recovered but there was a lot more to be had and work had started to gain access to a storeage tunnel but we got word that the govt was going to close the site down and this did occur and legislation was gazetted and back dated and police raided recovered material. Full permission had been given by the landowner Brisbane city council for the project. We were told that if you so much as found a bayonet or helmet in your back yard you had to seek govt permission to recover it and as far as aircraft in the bush went they would rather let it rot and have trees grow through the wings then have someone remove it to a place of safety for restoration.